NControl (MC) transmission playlists are the central cog in the NVerzion automated playout offering and can interface with master control and/or routing switchers for seamless on-air scheduling. Using built-in features to interface with a variety of master control switchers across a serial connection, NControl (MC) fires relays and triggers different switches to control all of a master control switcher’s activities while also managing and airing videotape or server-stored content. The system supports multiple playlists for continuous playout directly from the master playlist, or from lists built in advance by the network-attached traffic system. NControl, conversely, controls only the router output and manages playout of live video or control of applications/devices connected to the network. 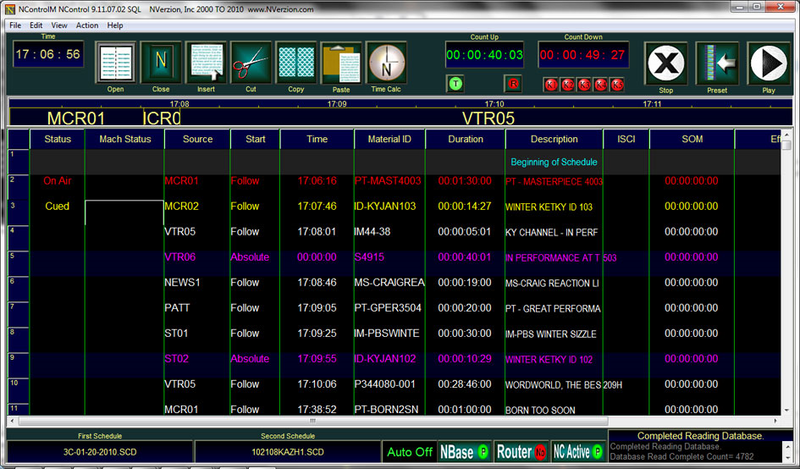 Both NControl and NControl (MC) support multiple playlists for continuous playout. The lists can be built in advance using a connected traffic system or directly from the master playlist. Users may also choose to control secondary events, such as audio playback devices for voiceovers, downstream keyers, logo inserters, and more — all from within the playlist.